Sadly, I am underwhelmed. I was expecting an entire new experience with all the changes Bungie has been touting, but it is not so. 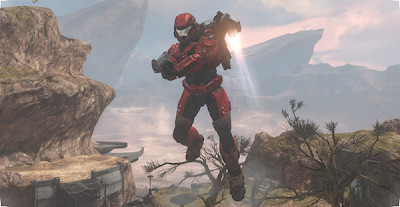 This is still the same old Halo you either love or hate. As for me, I'm pretty apathetic towards it. Players now select loadouts at the beginning of each game. This is fairly standard now in most FPS games, so it isn't surprising to see it in Halo. Each loadout contains different armor abilities to help change up the way your character plays. Sprint, Jetpack, Stealth, and Guard all lead to some new gameplay options but the game still plays like Halo. There are new weapons and game types which are always welcome. The weapons are interesting and I think they all have a place in the game. I really like headhunter and stockpile - two of the new game types. In headhunter you don't get points for your kills until you deposit the skulls of your victims in a designated spot. Opponents drop all collected skulls when they die, so areas can end up covered in skulls after a huge battle. There is a balancing act between killing, collecting, and delivering. It works well. In stockpile each team is given a base which counts down from 60. A bunch of neutral flags spawn all over the map and any flags in your base at the end of the 60 seconds count as points for your team. This repeats until one team reaches the point goal. Again, there is an interesting balance in this game type between collecting and delivering. Unfortunately, the thing I loathe the most about Halo is back; playlists. Instead of being able to select the game type I actually want to play I have to select a "playlist" where that game type is one of many. I hate it. I want to only play the new game types. I think they are fun. I don't enjoy any of the older modes at the moment. Why can't I just pick my game type? I've always hated this about the Halo series, but it looks like it's sticking around for another game. They did fix the veto system. It needed work. Now players vote on a map before it is loaded. Simple majority wins. It works a lot better than vetoing a game but not knowing what the other option will be. Bravo Bungie. The thing I was most looking forward to isn't yet in the beta. I really want to play Invasion. It looks intriguing with it's progressive map, objectives, and loadouts that unlock during the course of a level. I checked out Bungie.net and it looks like Invasion will be introduced on May 7th. I may not play the Reach beta again until then.